It’s amazing what knocking a few degrees off the thermometer can do, huh? A mild week weather-wise meant some quality miles were logged, leaving me feeling confident and strong. Thank goodness. I know we’re not out of the woods yet, but the mantra this summer–take advantage of every cool day; don’t dwell on the yucky, hot ones–is holding out. As I’m writing this, I think my elbow is the only thing NOT sore on my body. Even yoga hurt today. Hurts so good, right? Heck yes. Thank you cooler weather! A surprise double thanks to my first group run at my local running store. A mile-repeat workout on the track, the first in a long, long time. It felt exactly how you’d expect mile repeats to feel (umm…OUCH), but I’m pretty satisfied with my splits. It felt good to shake a little speed into my legs! 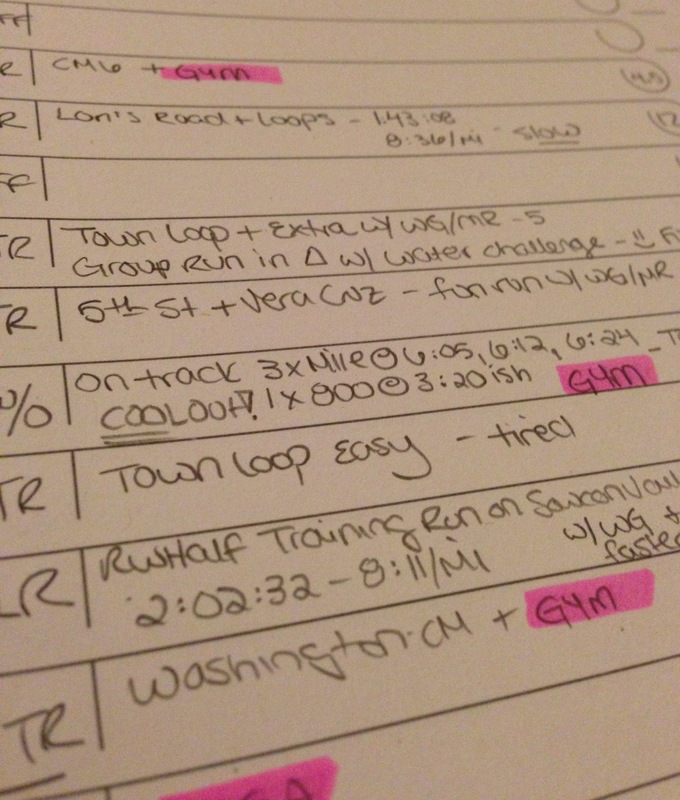 A 15-miler as a part of the first training run with the RW editors for the RW Half. 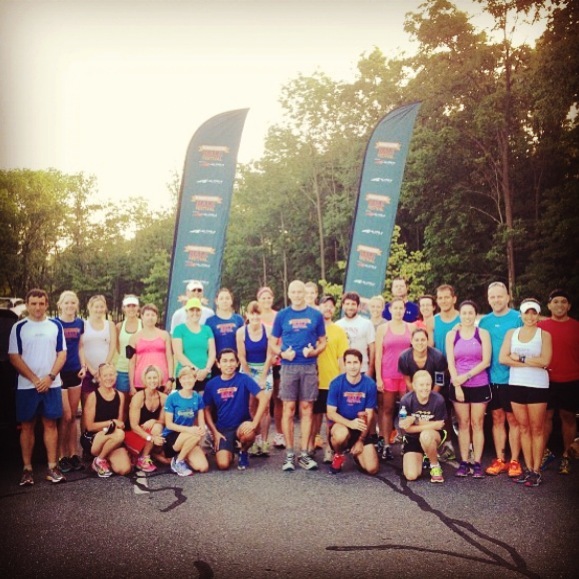 I ran 10 of them with work friends and Lehigh friends, which made those miles fly by. The last five I ran with WG, and they all ended up faster than the first 10. Sweet. Two lifting sessions. I’m pleasantly surprised that I still want to go to the gym. There’s something moderately addicting about sweating twice in one day. I certainly don’t hate it! Kept up my strawberry-banana-chocolate crepe streak – yes, this post-long run nom is becoming something of a habit. It just hits the spot, how can I resist? Participated in my first #runchat in a very long time and discovered a handful of fellow run-chatters also doing MCM! It’s still so cool to me how the running community–even the virtual variety–can be insanely motivating. Tried out these puppies. Verdict’s still out on how I feel about ’em, but they’re pretty sick looking, right? I feel like I’ve successfully hopped back on the bandwagon, and I’m holding on tight with both hands! Until next week! 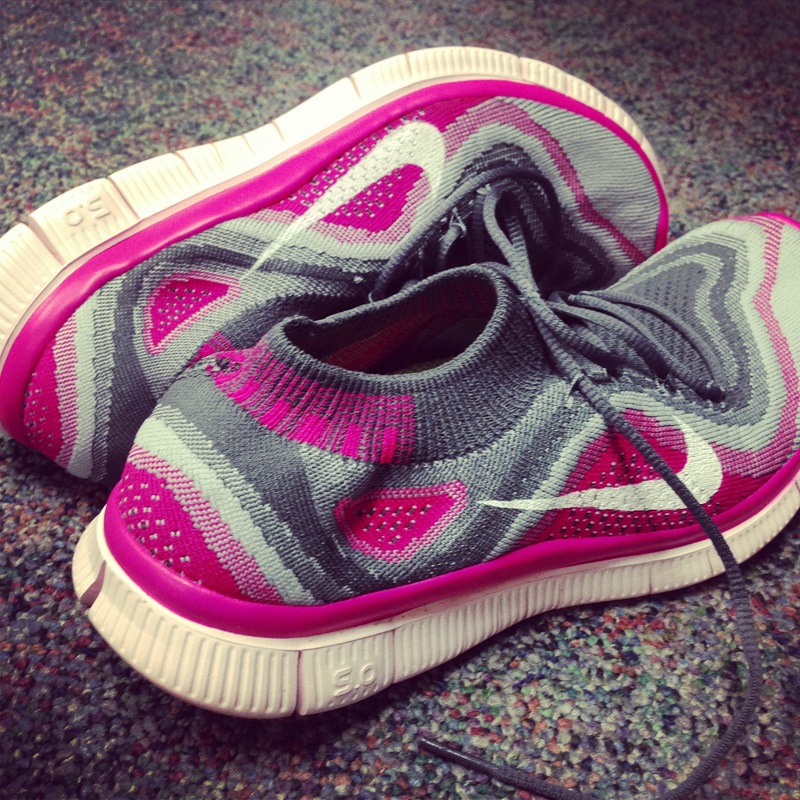 Oh my gosh, you have the Free Flyknits? We just got them at work today and I might be in NYC for an event for them Thursday (read: getting a free pair, ha). What do you think? Did you actually run in them? I tried them on and they feel like…supportive socks or something. Really comfy. Yep! I’m still torn. They are very different from what I normally run in (I need more support), but I liked them for the speed workout I did last week! Pleasantly surprised! They definitely feel like supportive socks, which isn’t a bad thing I think! Let me know what you think when you get ’em! I can relate to everything in this post! 1) I am running MCM 2) hot weather, travel, and a bad cold made me fall behind in my training… But it is still early so I am getting back on track. 3) I love taking advantage of some cooler less humid days… Ran 5 miles today and it felt great, even with a cold. But crossing my fingers it will be good weather for my long run later this week. 4) I still crave some heavy lifting sessions and some HIIT at the gym. I find myself doing a lot of 2 a days lately. 🙂 thanks for a great post. Good luck with the rest of your training. 1) HECK YES about MCM! 2) Yep, you’ve still got SO much time. I keep thinking race day will be here tomorrow, but I forget that September still exists! This happened to me last year, too. Lot’s and lot’s of time. =) 3) Ran 5 this morning and it was almost like fall weather, so perfect. I think we are almost over the sucky summer hump, my friend! 4) Great job with the lifting! Glad to have a friend in the two-a-day camp. We’re going to be STRONG for MCM! Keep it up! Congrats on a nice week of training (and the last 5 of 15 being faster, YAY negative splits!!!). The cooler temps lately have definitely helped with boosting motivation and making getting workouts in easier. You are going to do awesome at MCM! Cooler temps have been nice here too. Looks like a solid week of training! Congrats on a successful training week. Those shoes are so interesting looking. Can’t wait to hear what you think! See you in 21 short days!! !